Microsoft launches two funky-looking new webcams this week, the LifeCam Show and LifeCam VX-5500, both offering a host of handy, quirky new features and 'fun new video effects' for fans of online video chatting. "No matter where these LifeCams are used, they will make a statement," claims Microsoft. The statement being, presumably, "have a little look at my new webcam." 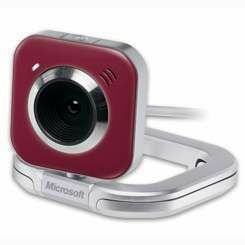 First up, the LifeCam Show is claimed to be one of the thinnest webcams on the market and the LifeCam VX-5500 goes for a "more sassy approach" with switchable faceplates (in patriotic blue, red and white) and a collapsible design. The LifeCam Show includes a noise-and-echo-cancelling microphone and offers users a 2-megapixel sensor for video (and 8-megapixel for stills) and is sold with a bundled magnetic laptop clip, a desktop stand and attachment discs that "allow users to attach the adhesive disc to the back of their laptop, giving them the ability to close their laptop easily with the webcam still attached for greater portability." The lower-range, cheaper LifeCam VX-5500 webcam also folds down (to pack into your lappy bag) and offers up a reasonable enough 640x480 video and 1.3-megapixel stills, alongside a unidirectional, noise-cancelling microphone. Both new webcams come bundled with Microsoft's own LifeCam software, "making it easier than ever for users to have a fun video call experience" with 30 new video effects to mess around with including new 3D Accessories, Facial Exaggerations and Filters so you can turn yourself into a bug, a cowboy or a bunch of other bizarre things, if you so wish. You also get access to Microsoft's new Video Messages service, in which users record and send videos through a Windows Vista gadget. For more on that check out the website. The new LifeCam Show and LifeCam VX-5500 both launch October 2008 at £79.95 and £49.99, respectively.